Livingston County District Judge Theresa Brennan was hit with a new second charge of Perjury as the preliminary examination starts in her criminal case. Brennan is now facing two counts of Perjury, Destroying Evidence and Misconduct in Office, and up to ten years in prison if convicted. The testimony today came from the former Chief Judge David Reader. He called Brennan to tell her that her husband had filed for divorce and that his attorney was Tom Kizer. 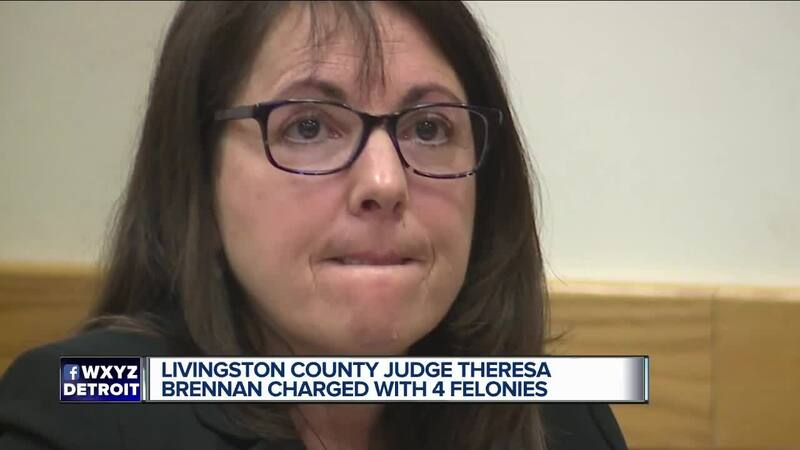 BRIGHTON, Mich. (WXYZ) — Livingston County District Judge Theresa Brennan was hit with a new second charge of Perjury as the preliminary examination starts in her criminal case. Brennan is now facing two counts of Perjury, Destroying Evidence and Misconduct in Office, and up to ten years in prison if convicted. The testimony today came from the former Chief Judge David Reader. He called Brennan to tell her that her husband had filed for divorce and that his attorney was Tom Kizer. “She gasped and said I have to go” Judge Reader testified. Kizer and Brennan have a history as Kizer has filed grievances against her. He would later take her deposition in the divorce and that’s where one of the Perjury charges is based. Brennan’s now ex-husband Donald Root testified briefly that he filed for divorce in December of 2016. The case was automatically assigned to Judge Brennan as she got all divorce cases without children. But she took several days to disqualify herself. Kizer had filed a motion to have Brennan’s cell phone preserved as it was owned by her husband’s business. The court reporter to Judge Brennan, Felicia Milhouse testified that Brennan wanted her personal email wiped clean from that iPhone and asked her to do it. After the phone was turned over and the criminal investigation started, Michigan State Police attempted to extract data from the phone, but an expert testified it had been wiped clean by being reset to factor settings. Before court today, Judge Brennan did not answer any of our questions. She has a case pending with the Judicial Tenure Commission that could oust her from the bench. She’s suspended with pay and free on bond. Her criminal case will continue on April 11 at 10:00 am in Howell.